Hey Latin fans, we’re back again, and this time around Rhias Hall was under the weather, so Jennifer Lovely called an audible and brought in me, Handsome Husband Jim for a show about hidden gems from the last 10 years. We have different tastes, so they’re very different lists. We also go over a couple of new movies, like Pet Sematary, but we cut the spoilery stuff to go after the credits. So if you want the whole truth of our opinions, keep listening like it was a Marvel movie for that after-credits goodness! And check out Rhias’ and Jillian’s podcast The Night Library for more book-related content! Hey, we’re back again, and this time Jennifer Lovely and Rhias Hall talk about movies with tiny terrors in them. They’re joined by our own little monster, Max the cat, who has big kitty opinions on everything. And no, I still haven’t watched Tag yet. Hey, horror fans, Jennifer Lovely and Rhias Hall are back, this time to discuss the genre of films various called Psychobiddy, Hagsploitation, or, as Jen prefers it, Grand Dame Guignol. Rhias will explain it better than I could in the episode, but it involves older actresses returning to the screen in horror roles. Plus the cats have lots of opinions, and little girls get nosebleeds. Enjoy! Gothic Charm School to finish up their discussion of television horror with their perennial favorites, Hannibal and Penny Dreadful. And that’s all they talk about. They really love Hannibal and Penny Dreadful, and hopefully you do (or will), too! Don’t Read The Latin! Episode 89: TV Horror Part 1! It’s another long one! Your hosts Jennifer Lovely and Rhias Hall are joined by Jillian Venters of Gothic Charm School to discuss their favorite horror on the television! And Netflix. And Prime. Let’s just say it’s stuff you don’t watch in the theater? Tune in next time for their very excited discussion of favorites Hannibal and Penny Dreadful! 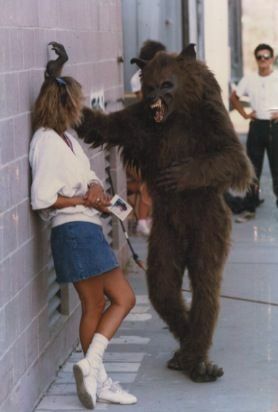 And since I, Handsome Husband Jim write these posts, I get to mention a show they didn’t, the 1980s show Werewolf, which was one of my first exposures to horror and can be summed up as the Incredible Hulk TV series, just with a shockingly well made werewolf instead of Lou Ferrigno. And who was quite the player behind the scenes. Don’t Read The Latin! Episode 88: 2018 Year End Review Part 2! Jennifer Lovely, Rhias Hall, Jillian Venters (of Gothic Charm School), and Jeff Harris (from Fanboy News Network), and Handsome Husband Jim’s picks for their top 5 of the year, along with some TV horror talk, and what they’re looking forward to in the new year. Don’t Read The Latin! Episode 88: 2018 Year End Review Part 1! It’s the end of the year and that means a look back at the horror movies of the past 365 days, though it feels like 365,000. Did you know that Black Panther came out this year? Crazy, right? Don’t Read The Latin! Episode 87: Single Location Horror! As foretold in last episode’s micommunication, this week your hosts discuss horror that happens in one place (but not in a house, since they just did that). Listen as Jennifer Lovely gives credit where it’s due for a director she dislikes, and Rhias Hall apologizes to Dave Navarro. Plus Handsome Husband Jim goes 1-1 for film recommendations! Don’t Read The Latin! Episode 86: Horror in Houses! Welcome back to Don’t Read the Latin, where two older ladies argue! (Trust me, that’ll make more sense after you listen.) This one is about horror movies set in houses… or at least that was the idea. Jennifer Lovely and Rhias Hall take you to a cul-de-sac of creepiness, so lock your doors and stay safe!